Just as the Center has been at the leading edge in developing new tools to create three-dimensional bathymetric seafloor maps, CCOM/JHC researchers are developing ways to extract the geological component from the acoustic “backscatter” signal to characterize the seafloor. Bathymetry and backscatter in the Shumagins (western Gulf of Alaska) showing rock outcroppings. Depths range from 80-120 m over the 6 km long transect. Data were collected using the ME70 fisheries multibeam echo-sounder, processed in custom MATLAB software, gridded and then plotted in Fledermaus. By improving the ability to remotely sense seafloor composition—coarse or fine sand, mud, rock, etc.—survey ships will be able to quickly and accurately map a diversity of seafloor habitats. To that end, the Center has a number of interconnected research programs dealing with a range of sensors (single beam, multibeam and sidescan sonars, lidar, video, etc.) and involving theoretical studies, the collection of remotely sensed data, and “ground-truth” samples. In this image, a) shows original backscatter mosaic with ship tracks in blue; b) shows result of oversegmentation—the original mosaic is divided into small segments, each is considered to be acoustically homogeneous; and c) is the result of coalescence of segments into several themes. 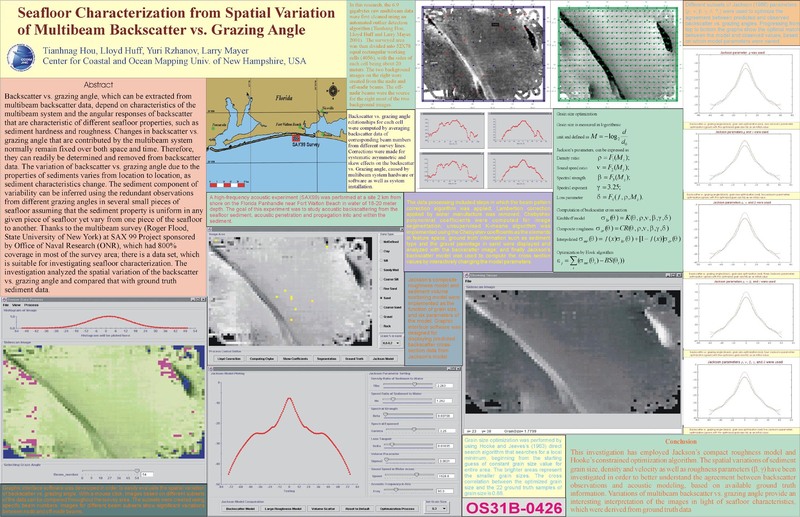 These efforts are particularly relevant for the increasingly important topic of fisheries habitat characterization, which is a one of the key goals of the Integrated Ocean and Coastal Mapping or “map once, use many times” approach to mapping the seafloor. CCOM/JHC has developed a software package that has successfully extracted remotely sensed backscatter data from small areas of seafloor. Still under development, the package has been incorporated into standard software for offshore mapping and, as it continues to be refined, will be a boon not only for habitat mapping but ocean engineering projects—aquaculture, wind farms, deep-ocean structures—that require highly accurate seafloor characterization.